As I was browsing through our collection of maps when I noticed something was a bit odd with almost all of them. Mainly, their names. I had trouble finding any that had the proper naming scheme that we use for images (as described on Help:Images). This was quite the issue, as we have well over one-thousand maps, and not much in the way for commonly used naming standards. Sometimes it's just an incorrectly capitalized word, and sometimes its because it seemed to predate anything resembling site standards. Regardless, it leads to us having a ton of things with either odd naming schemes, or are just clearly incorrect. And this agitates me, when I see the maps for Skyrim more or less all with standardized names that support site standards, and I see anything younger being entirely messed up. Maybe its because I've spent a lot of my time working on Skyrim recently, so I have grown accustomed to us largely keeping file naming under line, but I still wondered why it bugged me. Why should it? We had less of an idea of what we were doing, a lot of those maps are over a half-decade old! The site has changed a lot since then. And sure, it would take a lot of work to correct, but but then I realized why my time editing our Skyrim section has caused this to irk me. It's because I can type out the file name for essentially all of the images in the Skyrim namespace without a need to look them up. People spent a lot of time ensuring they follow a specific standard, and as such, other people are more likely to follow it naturally, as well as making the mistakes less time consuming to clean up and obvious. The reason is because once you build up an expectation for something, going without it is hellish. Familiarity is one of the greatest comforts in life, and I wasn't getting it. You don't have to look far too see how this is true. In fact, you can find numerous examples of this throughout the Elder Scrolls series. Let's pay attention to the out lash over what I feel was a logical alteration, making Alchemy something you can't do on the fly in Skyrim. 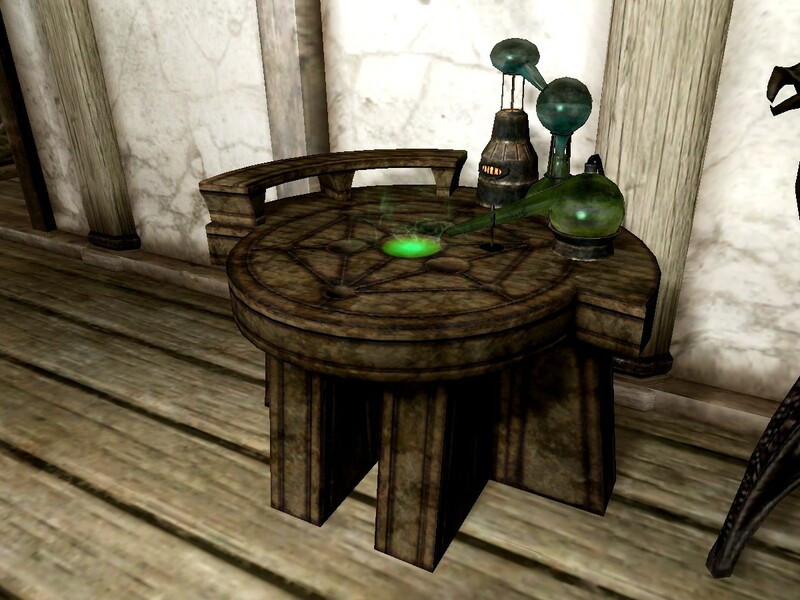 In Skyrim, you were reliant on clearly marked Alchemy Labs for your potion-making needs. This was a departure to how this skill worked in Morrowind and Oblivion. This is ignoring the shift from having to use a stationary Potion Maker in Daggerfall to the alchemy system featured in Morrowind. Because who seriously bothered with alchemy in that game? People got used to the relatively quick way potion-brewing worked in Morrowind and Oblivion, so something as simple as saying you have to be in one place to make potions changed how the game was played for a lot of people. I understand this aggravation, but I also get the reasoning behind the change. Does it really make sense to be able to do alchemy, what is supposed to be a precise science in the ES universe, in a second in the middle of a monster-infested cave, or at least doing that without a sturdy surface for all of the equipment? No it doesn't. It also made more sense when taken into consideration for the other things you could craft. As an example, consider Enchanting in Oblivion, which could only be done in the field if you had a Sigil Stone. However, this was ALSO a change on how Enchanting worked in Morrowind. In Morrowind, it could be done wherever you wanted, just like Alchemy. So you could say that each hero has grown increasingly incompetent after the Nerevarine. I know that almost all of the older Elder Scrolls fans certainly already say that. Now that I think about it, more and more examples of little and large mechanics have changed from game to game. Armor sets simplified, weapons removed, skills eliminated and merged, the drastic changes to the dialogue system, the removal of open cities, the removal of horses, the addition of horses, the addition of horse-mounted combat, the removal of spell crafting... the list just goes on and on. I could name examples all day. I'm not saying that changing things is bad, but it can be so aggravating that it hurts just to think about it. It's why you see people modding in skills like Acrobatics back into Skyrim, so they can have that sense of familiarity back. It also has something to do with the fact that movement in Skyrim is absolute crap now that all the athletics skills have been cut, the only way to get some advantage is to take the Sneak perk Silent Roll, and that's just ridiculous. "Oh, look at me! I'm so stealthy! Watch me do somersaults wherever I go! This was definitely a wise use of a perk point!" I'm just saying that when the Altmer are the fastest race in the game due to them being slightly taller than everyone else, and no other trait being relevant to this, you have issues. Now that I have successfully incorporated a cleverly hidden implication that Altmer are terrible, I think I'm going to get back to this at a later date. I've just barely scratched the surface here. Not that I expected to wrap this up in a single afternoon on a topic as broad as "Things That Have Changed From One Point in Time to the Next", but you get my point. Tune in next time for more minor gripes about petty issues within a video game series! It's basically all I have going on. This took far too long to write. I need to find less time-consuming blog topics.